We now offer full service catering services for Weddings, Corporate events, Birthday parties. Let us create a Gelato display of your flavors and serve your guests to order on site. For more information email us at info@bottegaitaliana.com. 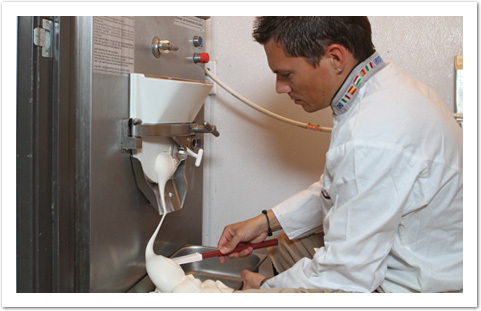 Wholesale Gelato for Restaurants, Grocery Stores, Catering Companies, and Special Events. Many fine restaurants, hotels and grocery stores are already satisfying the most discerning palates with Bottega Italiana gelato. Our distinctive products are proven to satisfy a clientele that demands high quality, while improving your bottom line. Entice every customer that walks through your doors with a tantalizing selection of fresh gelato and sorbetto! Choose from over 50 flavors or suggest your own. All we require is 48 hours notice! Our Seattle kitchen delivers to all surrounding areas. Our San Diego location services San Diego county, Los Angeles and even as far as Las Vegas. To conserve freshness and quality we personally deliver your order right to your door. "We are pleased to partner with a local business that shares our commitment to high quality standards and exceptional taste experiences." "Molto autentico! The next best thing to being in Italy. I wouldn’t serve anything else."